A night of music was held in Red Cow Hotel in Dublin on 21st of March 2008 to the eve of Afghan new year. In this event 3 Afghan musician Mr. Hakim Sanaie, Agmal Ahmad and Jawid Haydari who are living in Dublin performed music for the audience. In another program verses of the Holy Quran were read by Sultan Kabir Chakari. Nruddin Saljuqi the chair of the community gave a lecture about the history of Music in Afghanistan. Mr. Matin Rashidi and Hakim Sanaie read their poems. In this event beside the Afghan community including Afghan refugee and asylum seekers the representative of the local community also participated. A music film was screened for Cheaster Beathy Library in Dublin on March 2008. It was not a cinema film but a documentary produced by Professor of John Baily, the Reader of Goldsmith University in London. The film shows the connection of music among Kabul, Hamburg, London, and Dublin. The Afghan community of Ireland is delighted to participated is especial program at Near Fm Radio 101.6 on the 10th of December 2005. It should be mentioned that a group of Afghan living in Ireland were participated a course from 21-23 October 2005 as a pilot seminar in the framework of the Grundtvig project Inter media – intercultural training for Non-commercial Media in Europe. The course was covering topics of Method of multilingual programming , communication exercises , intercultural and diversity aspects of radio production of a short multilingual programmes , Introduction of radio campaigns. The participants have successfully completed the inter media course and got opportunity to perform a multilingual Radio program on human right at near Fm. In Radio program a number of Afghan living in Ireland such as Mr. Aminullah Nohmand, Nasruddin Saljuqi, Mr. Reshad Aryan, Mr. Hakim Sanihi, Mrs. Freh Said, Mrs. Gul Makay Aryan performed interview, talk and music in Persian, English and German Languages. The Master musicians Mr. Abdul Wahab Madadi who is living in Germany was the guest of Radio Near Fm and had interview over the phone with German journalist Mr. Thomas Janak in German language. The Dun Laoghaire festival of world culture took place from Friday 20th to Sunday 28th of august 2005. This festival was the largest festival which performed music and Art with over 160 events in 40 venues. Afghan community of Ireland is delighted to take a part in craft fair on Saturday 27th August in Dun Laoghaire Rathdown county council. In this event from Ensemble Gule Sorkh musicians Mr. Hakim Sanihie singer and Harmunium player and Agmal Bakhtyari on Tableh performed Afghan traditional music. Afghan community delighted to get opportunity to celebrate their New Year celebration in Dublin with Irish friends. The ceremony was held in Wynn’s Hotel on the 20th of March 2005. As there is a long history of celebrating New Year in different provinces in Afghanistan so a number of booklets were published during the past years in English and Persian. The program was chaired by Jamilah Shafq and opened with verses of Holy Quran by Waslat Bakhshi and than a number of Afghan participants such as Nasruddin Saljuqi Mr. Enayatullah Shafaq, Mr. Mr Reshad Aryan, Mr.Dr. Zekria Bakhshi, Mrs. Najieh Bakhshi, and Mr. Abdul Maroof Azad spoke about Afghan new year celebration and traditional customs. The event was marked by traditional music, dances, poems, talk and Afghan traditional food which were reflecting the vast cultural heritage of Afghanistan. A traditional song of Samanak performed by Afghan girls Barya Shafaq, Elaha Said, Shabnam Azad, Waslat bakhshi and Ahdiah Wasaie with acting of cooking Samanak. Afghan Music performed by Mr. Hakim Sanihie and Agmal Bakhtiari. A group of Afghan youth Mr. Esmayel Juma Khan, Ali Akbari, Hamid and Haroon Kazemi charmed the audience with a rap in Persian language. The function room in Wynn`s Hotel was packed tow capacity with Afghan and Irish guests. Among the guest were the deputy Lord Mayor of Dublin Mr.Andrew Montague and Mr.Phlip Watt of NCCRI( National ConsultiveCcomitee of Racism and Interculturalism). The program started from 6 pm and end at 11pm. 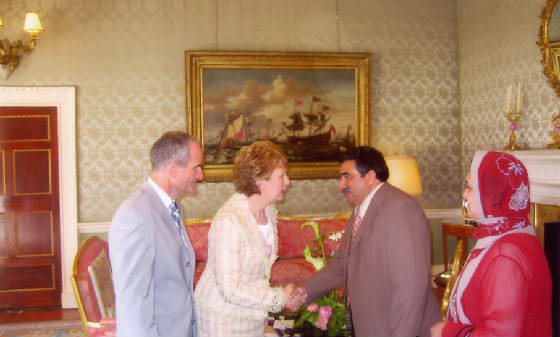 President Mary McAleese & Dr. Martin Mc Aleese invited different nationalities at Aras an Uachtarain on Monday 11th July 2005. On behalf of the Afghan community of Ireland Nasruddin Saljuqi and his wife Azizeh Saljuqi were invited in this party and they pleased to meet the president and Dr. Mc Aleese. The garden party began at 2.30pm and conclude at 4.30pm. Entertainment was provided by different nationalities. To prevent Racist violence a conference was held in Church House Westminster in London on 19th October 2005. The aim of the conference was an action to reduce Hate crime and promote community Cohesion – at home and across Europe. In this conference more than one hundred representative including European parliament member participated from all over Europe. There were three participants from Justice department and equality Law Reform , NCCRI and new community partnership(NCP) attended from Ireland. In this conference key speaker presented their presentation and talk and through out the conference the other were invited to share their experience of work in preventing racist violence with other practitioners who had inspire innovations and new initiatives in this area. As Nasruddin Saljuqi was attended from new community partner ship he had opportunity to raise his experience for anti racism. On summary of his speech he said that it should be mention that racist is a natural aspect in all over the world and its not new in Europe. People are facing racism in a country where you find same culture ,colure and religion etc and also can be felt in a country where you don’t see different nationalities. Its very important that a number of organization are working hard in civilized countries and their work is appreciated. 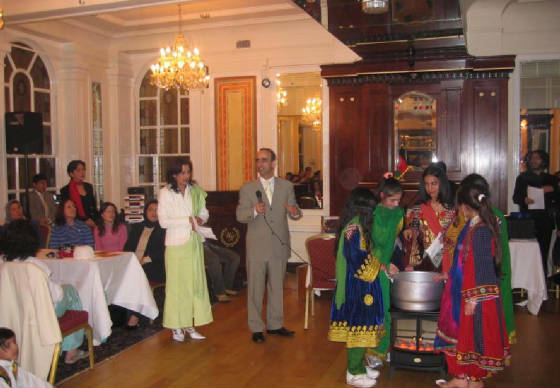 Afghan community of Ireland as the smallest community voluntary could participate in a number of anti racism program such as presenting exhibitions , interviews, event, traditional custom and giving article about Afghan culture. As I found out all activities had a good impact in the society. - Organization try to find out the root or bases of racism and than solve the problems. - Communities and Ethnic minority group who are facing racism are responsible to take a part for giving awareness about their culture and good behaviour. - Communities and ethnic minority group should assist anti racism organization. - Churches, school and police would act as a good organization to prevent racism in the society. Due to the notice of video diary all the talks are recorded on the day will compiled , edited or published on Runnymede we site: www.runnymedetrust.org.